As a large majority of video game releases from major developers and publishers seem to get easier as the years go by, many players lament the lack of challenge and the absence of satisfaction that comes from learning all of the intricacies of a level’s design, or the patterns of enemy characters. The indie game community, as it often does, steps in to fill this demand for challenging games that focus on making the player learn to be better, helping to develop their skills and reaction times to better conquer the challenges in front of them. Necrosphere Deluxe is one such game, and it uses the consistently popular “precision platformer” sub-genre to scratch that itch. While the silver age of platformers found in the eight-bit era varied greatly in difficulty from easy enough to brutally punishing, not very many actually had a focus on making the bulk of the gameplay itself be pixel-perfect collision detection thanks to the strictly designed physics of the game itself. Instead, a lot of the difficulty was pumped into the game in the form of cheap deaths by hard to avoid enemy sprites, too-long pitfalls, and obstacles that knocked you from moving platforms. Most often these were made cheap not because they were an obstacle to be learned and avoided, but because the dev would intentionally place these hazards just off screen so that you didn’t know they were there until it was too late. It could only be accomplished through trial and error, but in the worst way possible. Necrosphere Deluxe benefits greatly from not only improvements of gameplay mechanics in general, but also the now lost necessity to artificially inflate the difficulty of a game to make a player feel as though they got their money’s worth. While Necrosphere Deluxe is a short game to play through (it boasts “2.5 hours of NO FILLER gameplay”), it does make that time incredibly worthwhile, in addition to not having the restriction of only being able to be released at full retail, as it would have been in the past. People often wonder why price can play a role in a game’s review score or playability? This is exactly why. A 2.5 hour game with 8-bit graphics would feel like a rip off at even $40, but at $7.99, it is completely satisfactory from a value standpoint. Instead of just riding the wave of the success of its predecessors and copying their mechanics, Necrosphere Deluxe makes itself stand out by only giving the player two buttons to interact with the pseudo-purgatory they have built. You can press direction pad back to go left, and A to go right. You can also use the ZL and ZR buttons if you want at any time, no control option change necessary. To elevate yourself, there are gravity bubbles placed around each level in strategic locations. There are clear gravity bubbles that are permanent, and there are purple bubbles that disappear after you bounce off of them once. There are also anti-gravity beams that will propel you upward to the next platform. Accompanying these means of travel found from the beginning and throughout, there are also some skills that you unlock as you play through the game that allow you to further progress in the game than you initially can. In this sense, Necrosphere has some very light Metroidvania leanings, but it is a precision platformer through and through. You will be navigating one large level with a series of mostly one screen switch puzzles littered with checkpoints. Every time you die, you will begin at the last checkpoint, which is almost always immediately before the puzzle that killed you. While some of these bite-size platform sections will be frustrating or cause genuine anxiety due to repeated failures, this ability to repeat each section over and over to get the physics and jump timing down pat…as well as the obstacle placement and the ability to navigate back to where you need to be after hitting a switch or obtaining a new ability. True to its retro-inspired roots, Necrosphere Deluxe has a throwaway story to provide a bit of background to the world we are making our way through, and even offers an explanation for why it is ok that our beloved Agent Terry Cooper can fail so miserably and frequently without permanent damage- he’s already dead. Maybe. While on a mission, he falls unconscious and wakes up in the Necrosphere. As he navigates through the maze, he learns that this is where you go after you die, but there are warp points that will take you back to Normal Sphere (the world of the living), and that is your goal. Navigate the purgatory-like death world to avoid dying for eternity while dying hundreds of times in the process. Thankfully, because you develop your skills so much while playing the game, any subsequent playthroughs you undertake will all go a little more smoothly and take less time. There is also a bonus level called Terry’s Dream that must be completed in one attempt without checkpoints or saves. This is incredibly difficult, but probably only takes about 10 minutes once you learn the ropes. The two button control scheme does take a little getting used to, but not because it isn’t responsive or doesn’t feel right. No, it takes some getting used to because of the lack of the ability to manually jump is frustrating. However, the level design feels incredibly fine-tuned around the controls, and after your first dozen or so deaths, you get such a feel for them that it would seem odd to be able to manually jump after thirty minutes or so. While it is so counter-intuitive to a platformer game to not have a jump button, it works incredibly well, and highlights one of the game’s strongest aspects–clever use of its own limitations on the player to design a satisfying experience. On top of this lovingly crafted world built on a two button limitation, I cannot emphasize enough how satisfying the sound design is for Necrosphere, and the music is among the best I’ve heard over the last few years. 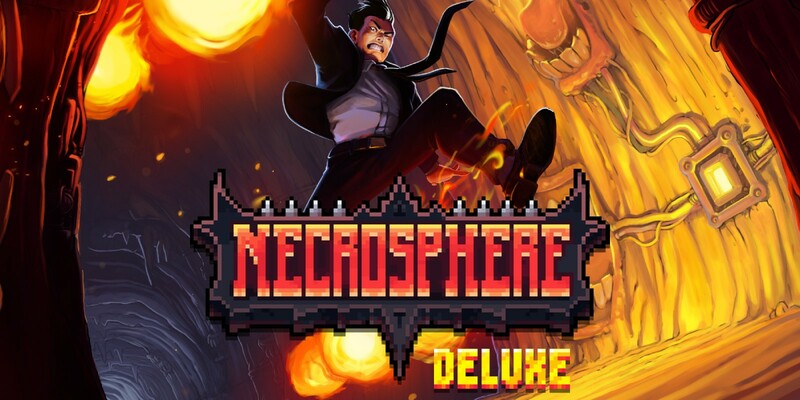 If you love precision platformers and challenging gameplay, you will love Necrosphere Deluxe. It may not reach the lofty heights of other indie entries into this oft-neglected by major studios sub-genre, but it does a great job of standing on its own merits and never feeling too much like any other specific game. Should you wish to check out another of our reviews, you can do so by clicking here.